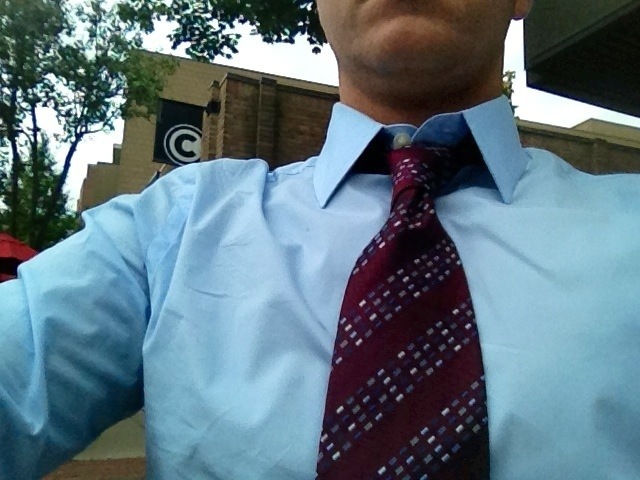 “44 Days of Ties” rolls on with another shirt-tie combo from Express. I’m thinking I should reach out to them and see if they’ll sponsor my “44 Days of Ties” project. Today’s tie is burgundy with diagonal stripes which, if you look closely, are a bunch of rectangles, each a different shade of blue and blue-gray. It makes this tie VERY versatile and it can be worn with blue shirts, white shirts, dark colored suits, or a light-grey suit. And like all my Express ties, it forms a Windsor knot and dimple very easily. In the background, you’ll notice a “C” which is outside one of my favorite locally owned coffee shops and eateries …Commonwealth. Located in Birmingham, they roast their beans on-site, daily, and brew each cup of coffee at 201* using a pour-through method. It’s pretty cool …I should post a picture for people not familiar with this method …the coffee drips into a beaker, like in a science lab, and then they pour it into a cup for your consumption (it’s in the video below). It’s very showy and a single cup of coffee can cost from $3 up to $8 (for the AMAZING Columbian they have), but it’s cool …and tastes fantastic. And it’s a really cool place to eat breakfast …I always order their Breakfast Burrito or Common Breakfast. They even serve water in such a way you would swear the water is also better at Commonwealth. And I once sat at a table right next to Steve Yzerman and his family. Looks like I have about a dozen people really into my ties, and my cousin Kyle is joining the movement.